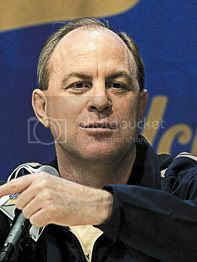 Darren Collison is expected to return to the line-up no earlier than the November 28 contest against George Washington, UCLA Coach Ben Howland said at the team's weekly media conference. "It's only been 12 days since he injured it, and he's not as far along as I had hoped in terms of his conditioning," Howland said. "Were he to play on Monday and Tuesday I'm not even sure he would be very effective because he's so winded right now. He didn't do anything for 10 days." Howland understands its a long season and he'll need his junior point-guard healthy for Pac-10 conference play and tournament time. More importantly, he wants to make sure Collison does not injure his knee any further. "We're going to be very conservative and careful with this, " Howland said. "My biggest concern is I don't want anything to happen to him long term." It is not the right thing to encourage him to play Monday and tuesday. The worst thing possible to do is have him come back to soon and re-injure it or tweak it and then he's out for a longer period of time." When Collison hurt his knee against Azusa Pacific, many braced for the worst, but after an MRI indicated it was only a mild left knee sprain, the prevailing thought was that he'd be back relatively soon. "It's unfortunate because I was optimistic that he would be ready to go, but it's just probably not prudent to try to push him," Howland said. "A lot of it for him is confidence right now. By doing it more and more every day, I think he'll be fine because there's perfect stability in the leg, he's got good strength, there's no loss of strength there. I am confident that given another 10 days to two weeks be should be back to close to full strength." For the past week Collison thought he could play soon as well but agreed it was best for him not to push it so early in the season. "I'm not trying to re-injure it," Collison said. "I can play and I'm sure my instincts would come in and I could do a lot of good things on the court but you never know at that given moment if you might re-injure it and that's the scary part." Collison has been doing sprinting drills the last few days but has been somewhat hesitant making cuts. For the next few days, he'll also be working on the exercise bike to improve his conditioning. With Collison out, the Bruins will look for sophomore Russell Westbrook to steer the ship at the point. Against Maryland, he will be facing a team that will press after every made basket. Moreover, the Terrapins start Greivis Vasquez, a member of the Venezuelan national team. He is a long-armed and experienced 6'6 guard who will challenge Westbrook from the start. If the Bruins get past Maryland it won't get any easier for Westbrook because it sets up a potential match-up with Michigan State and Drew Neitzel, the Spartan's preseason All-American point-guard. Nevertheless, Howland has been impressed with Westbrook's progress, in particular in cutting down his turnovers the past couple of contests. "He's more under control, the last two games," Howland said. "He's had 4 turnovers and 15 assists. He's getting better and better, and with Darren being out he's getting more experience at the point." Howland was hopeful another injured letterman, Michael Roll, might be back by the George Washington game as well, but thought Roll might take a few days longer. Both Collison and Roll will make the road trip to Kansas City. BBR Notes: The team is leaving for the CBE Classic on Saturday afternoon after practice. They will have a Sunday practice at 1:30 and then the Bruins will attend a reception in honor of former UCLA great Kareem Abdul-Jabbar who is being inducted into the College Basketball Hall of Fame this weekend. How can you not love Arron Afflalo! Love the video. Wish him all the best in the NBA.